Are you afflicted with “Jargon Madness”? Yes, it’s a real disease and most of us have had a bout of it a few times in our business lives. It creeps in when we least expect it, when our defenses are down, auto-pilot is on and we revert to the easiest way we know to explain what we do and who we are: Business Speak. Words that have been hijacked into the business world and used so repetitively they have lost their power to communicate true meaning. This business speak increases the distance between us and our customer, creates a communication hurdle, and most importantly does not let you, and what you are really trying to say, shine through. Which, in the end, is what our clients and customers really want to see. 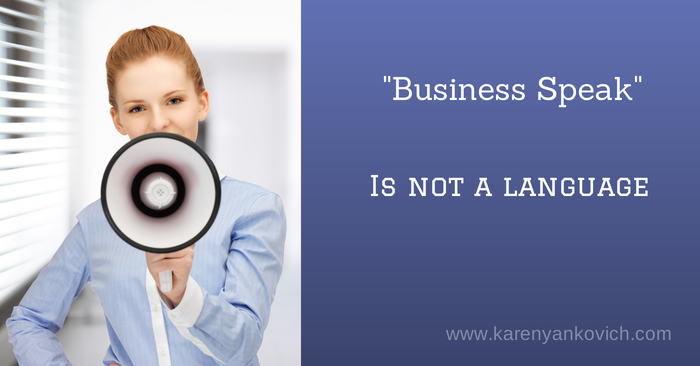 PLEASE remember not to use “Business Speak” in your social media posts! Luckily there is a cure! It takes a little bit of effort but with a few tips, you’ll recognize the signs and take steps to recover quickly. Step one: Free write first. Try things out, jot words and sentences down that you use every day. Did you say something clever and poignant with a client? Brilliant. Please write it down so you can use it again! Step Two: Read it out loud. Does it sound like you? Does it make sense to someone not in the business? Try it on your five year old! One of the best ideas I have ever heard when trying to describe What I Do on paper is to write in terms a toddler could understand. The real core of what you are trying to do always comes through. Of course embellish as needed, but use this foundation over and over again. Step Three: Replace words and get more specific. Does your post contain words such as mentioned above? Shorthand for us in the business world who know what we are trying to “get at”, but for others it just confuses the issue. When you talk about values, name them and say why they are important to you. When you talk about “best practice” explain (or better yet show) what that exactly entails from you. When you talk about “synergy” show us how you actually – ahem – cooperate in order to get your brilliant work done. Step Four: Be Genuine. You are trying to build relationships, and people want to know you are human. Show your clients how amazingly refreshingly non-robotic you are with stories and images from your real life, all pointing to specific results that you will achieve for them. One quick tip I have used that helps with all of the above – I record myself. Use your phone’s voice memo function and just have a chat with your “best friend”. who you want to serve. If you already have recordings of webinars or workshops you run, fabulous. But the above trick works very well because it is easy, takes almost no extra time, and yet the information you will uncover is worth it’s weight in gold. Soon enough you will have a layer of “you-isms” that explain you, your business, and what you offer in a unique, yet understandable way, a way that your future customers can’t help but take notice. As always I love to know what you uncover. Join me in my LinkedIn group, and share with the group what of the above tips you will try first and what hurdles you overcome. Thanks Karen. This is such a timely and useful post for me! I love the idea of recording my riff. I am going to do just that! Being genuine is really great advice, but being able find my speaking tone when I am writing and posting is how that genuineness can be seen. Great post Karen! I love the Richard Branson quote and I totally agree. I will definitely record myself and read my posts out loud. Such great tips! Thank you! “Open the Kimono” needs to be put out to pasture. It’s both culturally insensitive and super super gross. Let’s all keep our kimonos closed and just talk to one another. Amiright?